Fall is here and the weather is turner cooler, even here in Florida. The cooler weather is perfect for a day outside, hiking, and exploring all your favorite local travel spots. After a day of adventure, it's nice to come home to a nice hot comfort meal, especially a healthier version that's quick and easy. This recipe for Vegetable Chili with kale and quinoa is the perfect way to get the comfort of chili with a healthier twist. Directions: In large Dutch oven, heat oil over medium-low heat. Sauté onion, carrot and celery 10 minutes. Stir in zucchini and next 3 ingredients and sauté 8 minutes. Stir in chili, quinoa and kale and simmer 15 minutes. 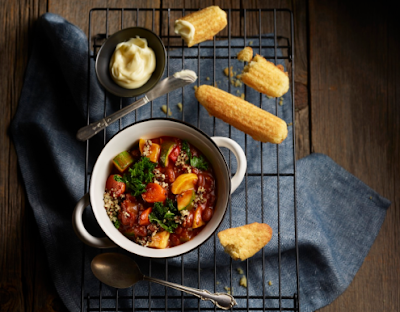 What's your favorite twist on chili?